How can we move naturally? 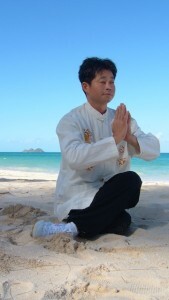 The first principle of Qigong is relaxation. We must learn how to relax. Many people think that is simply, not holding their muscles tight means they are relaxed, actually they are not relaxed enough. True relaxation requires a high level of skill as it comes from the inside out. This takes years or even a life time to develop. Some may not even reach it, but we can improve our relaxation by practising Qigong, particularly the movements. When we move our hands up and down, most people will lift their shoulders up and down. This causes them to tense their necks and this makes their breathing and even their minds tense as well. So the first step to relaxation is relaxing the shoulders. In our practice we have Balancing Gong and if you can do this well, then you will definitely know how to relax the shoulders. Also bending and straightening the knees teaches us how to relax the body. Many people, when they bend their knees, they lean forwards and so their knees go over their toes. This can create tension in the lower back and this can affect the kidneys. So, we must learn how to move in the correct way, with relaxation in order to bring they body back to normal and improve our health.